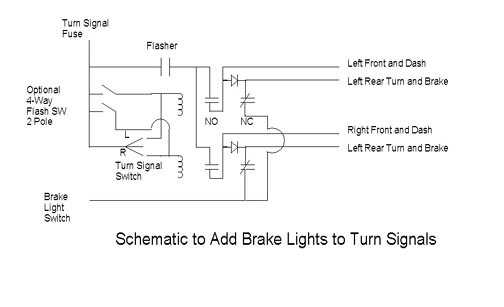 Attached is schematic for adding brake lights to rear turn signal bulbs. Need to add two, double pole, double throw relays and two diodes. If this doesn't work, let me know. I still think that the 56-57 T-Bird/Lincoln turn signal switch is cleaner and easier. No relays, no extra switches, no diodes, etc. It uses the existing rear turn signal bulbs as extra brake lights with **NO** visible external modifications. Compare the (Lincoln) switch in the photo with your stock 41-48 Lincoln turn signal switch. It's a direct, bolt-in replacement with all the necessary additional wiring. The only problem is pulling the additional wires down the steering column. It's easier than it sounds because the 12 volt wires are thinner than the original 6 volt wires. The short distance and infrequent use of the smaller wires doesn't pose any problem. 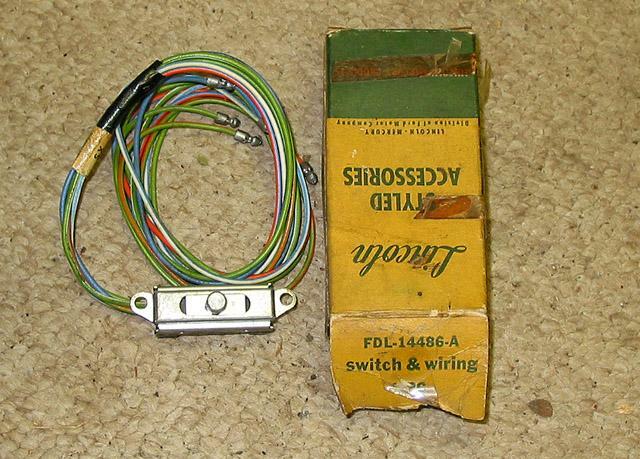 This is the same switch that is used in 1956-57 T-Birds and is available (NEW) from T-Bird parts dealers for about $90. 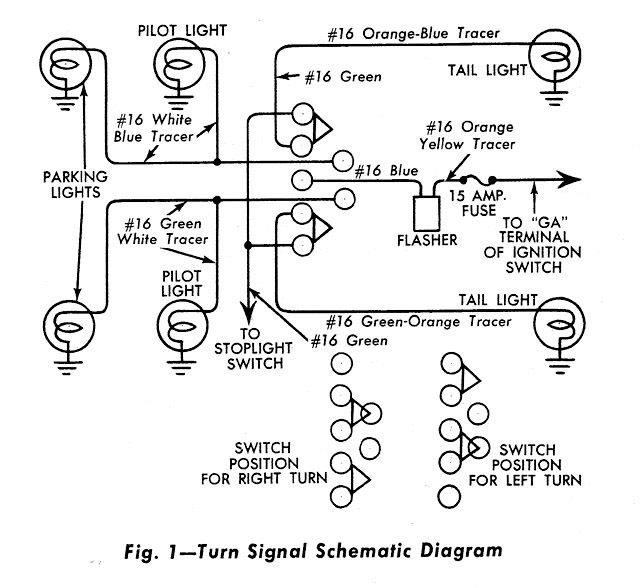 The turn signal schematic is from a 1955 Ford shop manual. The color codes might be different for later models. Looks like this would work. I notice the 56-58 Ford passenger car is about the same, PN B6AZ13341-A, but with a 35.25" pigtail instead of 26.5" for T-Bird. Might be easier to find. Think these would also work? Could be. If you can find a picture of the Ford switch, please post it. I know that later Ford, Mercury, and Lincoln turn signal switches are very different but I'm not sure what switches were used in Ford trucks of those years. We know that Ford used the same parts in many different vehicles but nobody seems to know which ones. Perhaps a "Hollander Interchange Manual" would help, if anybody has one. The switch I used in my '47 Continental came from a '57 Lincoln that I parted out for the driveline in 1969. I also harvested a vacuum operated automatic starter switch from that car. When the ignition is turned on (in neutral) the switch applies power to the starter solenoid until the engine starts and produces vacuum, then turns off the starter. It really fakes out passengers when the car starts itself. I then used the starter button as a horn button. A subtle theft prevention protection. The switch in the photo came from ebay some time ago. The part number on the box is obsolete - no longer available. I got another switch from Herb Scheffer of the "Lincoln/Mercury Old Parts Store" in Clearwater, FL (recommended by John Murphy) before I discovered that they are available NEW at Larry's T-Bird parts store. I'm really nervous about driving my '41 Continental in todays traffic with only the one little center brake light!